Monkeys perform amazing acrobatic feats every day; from leaping from tree to tree through the tropical jungles, to climbing higher and higher in their labyrinths of branches. So it should come as no surprise to you to see that they can also perform back-flips. 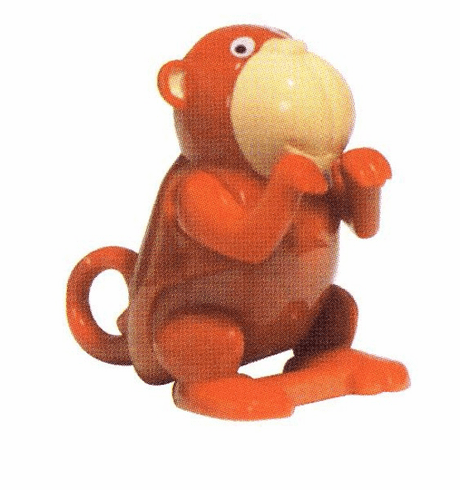 When cranked using the knob on his side, this wind-up monkey crouches on its hind legs, and leans slowly forward, preparing for coming leap. When he's leaned far enough forward, the monkey lets loose with an impressive back-flip, landed right back on his feet! Then he leans over to do it all again! Makes for an excellent gift for kids or a fun desk toy.